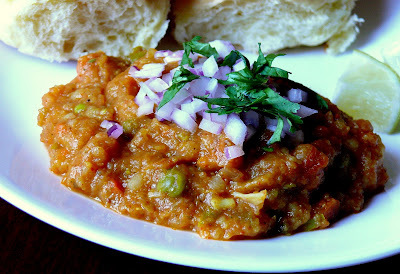 Pav bhajji served with onion and lime. A delicious mix of many vegetables and spices, Pav Bhajji a popular Mumbai chat food is also available in almost all hotels and eateries in most cities of India. Pav meaning bread and Bhajji is the gravy accompanying the bread. In my college days, our group of friends had a great time bunking classes, going out for movies and eating chat items particularly Pav bhajji after the movie. The road side food especially were very tasty~it could be the magic of the street vendor preparing them or even worse the dust and dirt. Whatever the reason could be, we had a great time. Pav Bhajji is a party favorite in our family and my daughter loves them. Pav Bhajji is high in carbohydrates and fat but do not compromise on the use of butter while serving which enhances the flavor. Cook all the vegetables in a pressure cooker. In the same pressure cooker cook the potatoes separately. When cooked, mash the vegetables and the potatoes. this should approximately come to 4 cups. Boil water in a vessel/pan, add the tomatoes to blanch. When water starts to boil and the skin peels out, drain and let them cool. When cool grind in a mixer. Grind the green chillies to a fine paste. In a kadai/pan, fry the onions in oil. When they turn transparent, add the green chilli and ginger garlic paste. Fry for few minutes. Now add turmeric,chilli, pav bhajji masala powders, salt and the pureed tomatoes. Fry this mixture until it gets thick or the raw smell goes. Now add the mashed vegetables, stir well for about 4 to 5 minutes and then add the mashed potatoes. Finally add the chopped capsicum/bell pepper, cumin powder and kasoori methi. Serve hot pav lightly toasted in butter with some chopped onions and lime. Tips: You could use as many vegetables as you wish, typically the above mentioned vegies are used. I've used Kashmiri chilli powder to enhance the flavor and color of the dish. If you are using regular chilli powder, reduce the quantity to 1/2 a teaspoon. Pav bread is easy to find in India in all bakeries and supermarkets. In US, I buy the Hawaiian sweet bread available at all American grocery stores. The bread in the picture was from the local Vietnamese store. The above mentioned quantity serves four. Looks just perfect as a weekend snack! 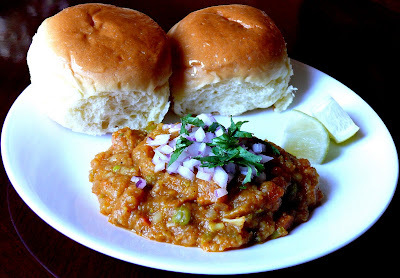 ooh, pav bhaji looks so perfect and mouth-watering. Lovely pic. I am a huge fan of pav bhaji... love your presentation. That plate is so tempting, bhaji looks perfect. Lovely pic. Nice recipe. I don't usually blanch the tomatoes. I will try it next time. Thanks for the recipe. Looks like the ones served in the restaurants. I'm going to try MTR brand the next time. Recently I bought the Sanjeev Kapoor's brand for the first time and I didn't like the taste that much. I did not like the Sanjeev Kapoor brand either. That looks delicious... My all time favourite! delicious pavbhaji cilantro. I loved ur blog. ur pic are so tempting, keep it up yar. I have added ur url in my favourites.